What would we do without Thyme? It’s sort of like your best friend… one that doesn’t talk a lot. Rich and savory, thyme adds depth to anything that you cook. It blends well with just about any other herb to brighten that flavor. You can’t go wrong throwing a little thyme in with almost anything you cook. Sold at the peak of freshness. 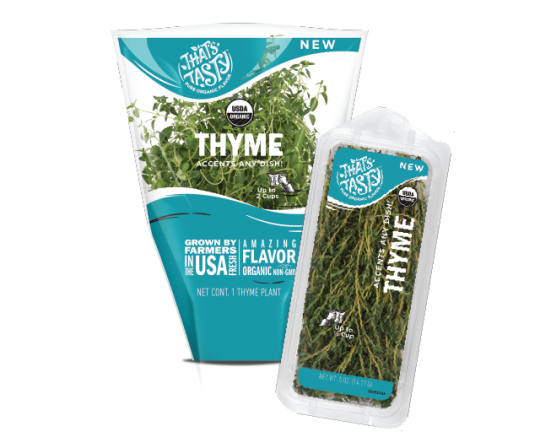 All of our thyme products are grown and sold to be used right away for the best flavor. Selected for outstanding flavor, the varieties we grow give the best flavor to your cooking. Feel that tongue tingling spirit of thyme? That’s how you know it’s good. The ultimate helpmate. You make our lives so flavorful. For best results, keep cold in your crisper drawer. Thyme should easily last a week. It will start to look dry and brown when it goes bad. Obviously if mold is present, it’s time to get some more. Have extra thyme? No problem. Try these fresh ideas for how to use it quickly. Freeze pureed thyme in ice cube trays with a little olive oil. These little favor bombs are perfect to quickly add flavor to a roast, chicken or vegetables. Just drop a few in the pan before you roast or cook in the crockpot. It’s also great to use as a marinade. Make a thyme sachet to keep the bugs away. Rubber band the stems together and hang upside down in dry dark location. (Normally a pantry is perfect.) When crispy to the touch it’s ready. Wrap in some cheesecloth, tie with a string and you are done. Place in your drawer.